Committee on National Economy and Industry (KEIN) visited the factory of PT. 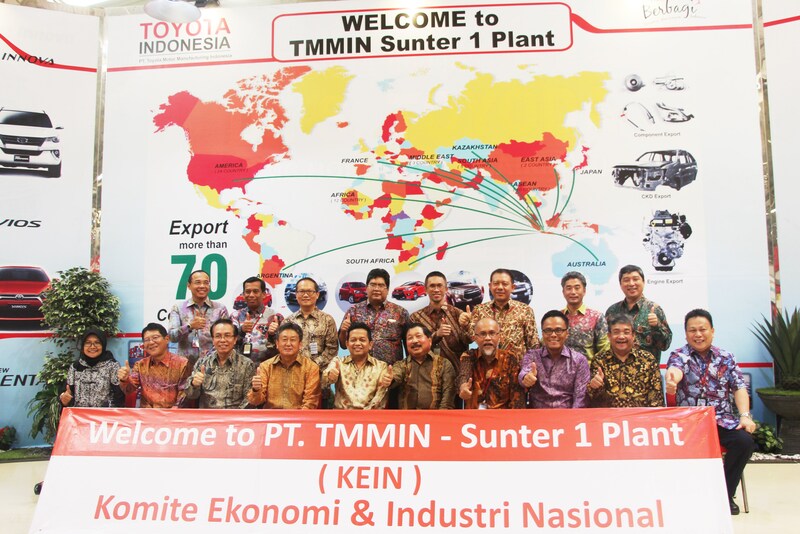 Toyota Motor Manufacturing Indonesia in Sunter, Monday (9/5). KEIN chairman, Sutrisno Bachir was accompanied by members of KEIN like Benny Pasaribu, Johnny Darmawan, Donny Oskaria, Hendri Saparini and others make a visit in order to get feedback from industry players to strengthen the national industrial structure. As a committee that appointed by President Jokowi, it's like a strategic move to KEIN in providing advice and recommendations on the issues of industrial economy to the President and the related ministers. By doing this visit, it is expected there will be common vision and vision-mission between the government and industry stakeholders in order to develop and strengthen national industry. "KEIN will be more proactive on bridging private and public interests. KEIN also asked Toyota in order to participate to support the government in building a strong national industry." Said the KEIN chairman, Sutrisno Bachir. In a response, Vice President TMMIN, Warih Andang Tjahjono said, "TMMIN ready to be a partner of government to develop a national automotive industry."